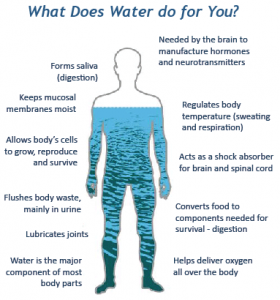 Up to 60% of the human adult body is water. The brain and heart are composed of 73% water, and the lungs are about 83% water. The skin contains 64% water, muscles and kidneys are 79%, and even the bones are watery: 31%. The life of the water is minerals. That’s how everything works inside our body is minerals. Minerals are inorganic and organic substances that originate in the earth and cannot made in the body. Electric lights, the nerves can’t work without minerals, we can’t even make adrenaline, cortisol or mineralocorticoid, any of those without minerals. Minerals, including metallic, non-metallic, organic and inorganic, are needed for the proper composition of body fluids, the formation of bone and blood and in the maintenance of healthy nerve function. Most of the minerals aid in body metabolism, water balance, and bone health, and they can also effectively boost health in hundreds of other small ways. Different minerals have different benefits, so no mineral can be termed as more beneficial or less beneficial than another. All minerals, even trace ones, are critical for the proper functioning of the body. Many vitamins and enzymes cannot function without minerals, and many hormonal responses need minerals to function. Therefore, a lack of minerals can interfere, or even stop, with many important body functions, such a detoxification, processing of other nutrients, cellular communication, etc. Zinc: It is an essential component of more than 10 important enzymatic functions of the body. Without zinc, the body will quickly lose overall function and results in a number of health concerns, including the inability to heal wounds, store insulin, fight off disease, develop proper growth patterns, as well as defend against a variety of skin infections. This mineral helps in treating eczema, acne, night blindness and prostate disorders, relieving cold, and managing weight. Zincalso ensures healthy pregnancy and reproduction. Eating whole foods, i.e. animal meats, eggs, and vegetables that are cooked enough to break their cellulose wall (fiber) which releases nutrients and minerals. Healthy fats : olive oil, avocados, coconut oil, almond and consuming plenty of “good” natural fats from animal sources, which help the body pull the nutrients out of foods during digestion. These fats are also necessary for the healthy construction of all cell membranes which makes them able to transport nutrients in and out as needed, and to also to get rid of natural cellular wastes. Drinking water that contains natural minerals direct from Nature. Do not drink softened water which contains too much sodium, nor Reverse Osmosis or Distilled water which are devoid of natural minerals and leach minerals from the body. Instead, use a charcoal filter, like Britta or PUR, to filter regular tap water. There are no processed minerals on the market that can possibly duplicate what Nature provides. Consuming “good” ocean sea salt which contains over 84 minerals – 1 to 1 1/2 teaspoons per day. Taking calcium and magnesium supplements as needed, particularly if a person does not have dairy products.